HALIFAX, NOVA SCOTIA--(Marketwire - Dec. 7, 2009) - Corridor Resources Inc. ("Corridor")(TSX:CDH) announced today that it has entered into a farmout and option agreement ("Agreement") with Apache Canada Ltd. ("Apache") to appraise and potentially develop oil and natural gas resources in southern New Brunswick. Under the terms of the Agreement, Apache has committed to conduct an appraisal program consisting of any combination of seismic, drilling, fracturing, testing and completing or abandoning one or more horizontal or vertical oil, gas and/or shale gas wells. The program is to be conducted over the next 18 months at a cost of not less than $25 million and is intended to evaluate the commercial potential of natural gas development in the Frederick Brook shale formation and light oil development at the recent Caledonia oil discovery. Upon completion of this program, Apache will have earned a 50% working interest in the spacing units drilled. Upon completion of the appraisal program described above, on or before June 1, 2011, Apache will have the option to elect to conduct a further program which shall consist of any combination of activities including seismic, drilling, fracturing, testing and completing or abandoning appraisal and development wells and the construction of a 20 kilometer natural gas pipeline from the Elgin area connecting to Corridor's natural gas plant at the McCully Field. If the option is elected, Apache will also purchase at cost a 50% working interest in the Green Road G-41 well and spacing unit, and the purchase price will be part of the expenditure commitment for the option program. This second (optional) phase of activities is to be completed by no later than March 31, 2013 and requires the expenditure of not less than $100 million. Apache will be the Operator for all activities undertaken pursuant to the Agreement. Upon completion of this program, Apache would earn a 50% working interest in approximately 116,000 net acres currently held 100% by Corridor. Thereafter, Corridor would be a 50% paying participant in all further activities on the farmout lands (please refer to the map below outlining the lands subject to this Agreement). The farmout lands exclude Corridor's interests in the McCully Lands as shown on the map: http://media3.marketwire.com/docs/Farmout_Lands.jpg. "Corridor is pleased to have Apache as an operating partner to help unlock and produce the significant natural gas potential of the Frederick Brook shale formation" said Norm Miller, Corridor's president. "We look forward to working closely with Apache on this exciting program". Corridor is a junior resource company engaged in the exploration for and development and production of petroleum and natural gas onshore in New Brunswick, Prince Edward Island and Quebec and offshore in the Gulf of St. Lawrence. 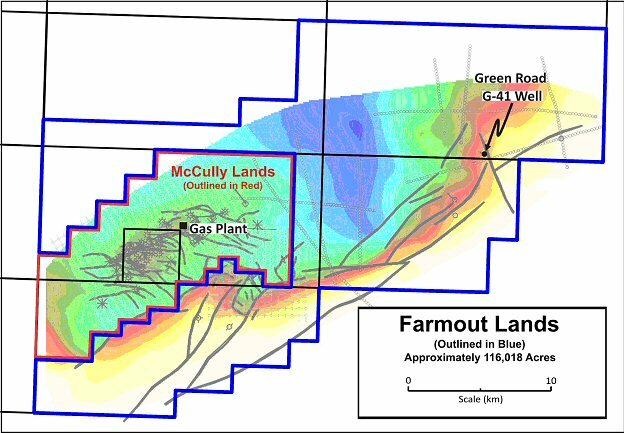 Corridor currently has reserves of natural gas at only one property, the McCully Field near Sussex, New Brunswick. In June 2007, Corridor completed the construction of a field gathering system, a gas plant and a pipeline lateral connecting the McCully Field to markets through the Maritimes & Northeast Pipeline. This press release contains certain forward-looking statements and forward-looking information (collectively referred to herein as "forward-looking statements") within the meaning of Canadian securities laws. All statements other than statements of historical fact are forward-looking statements. Forward-looking information typically contains statements with words such as "anticipate", "believe", "plan", "continuous", "estimate", "expect", "may", "will", "project", "should", or similar words suggesting future outcomes. In particular, this press release contains forward-looking statements pertaining to the Agreement, including the appraisal program, Apache's commitment to make expenditures, and the potential exercise of Apache's option. Undue reliance should not be placed on forward-looking statements, which are inherently uncertain, are based on estimates and assumptions, and are subject to known and unknown risks and uncertainties (both general and specific) that contribute to the possibility that the future events or circumstances contemplated by the forward-looking statements will not occur. There can be no assurance that the plans, intentions or expectations upon which forward-looking statements are based will in fact be realized. Actual results will differ, and the difference may be material and adverse to the Corporation and its shareholders. Forward-looking statements are based on the provisions of the Agreement and Corridor's current beliefs as well as assumptions made by, and information currently available to, Corridor concerning anticipated financial performance, business prospects, strategies, regulatory developments, future natural gas commodity prices, future natural gas production levels, the ability to obtain equipment in a timely manner to carry out development activities, the ability to market natural gas successfully to current and new customers, the impact of increasing competition, the ability to obtain financing on acceptable terms, and the ability to add production and reserves through development and exploration activities. Although management considers these assumptions to be reasonable based on information currently available to it, they may prove to be incorrect. By their very nature, forward-looking statements involve inherent risks and uncertainties, both general and specific, and risks that forward-looking statements will not be achieved. These factors may be found under the heading "Risk Factors" in Corridor's Annual Information Form for the year ended December 31, 2008 and also in Corridor's management's discussion and analysis for the nine months ended September 30, 2009, copies of which are available on SEDAR website at www.sedar.com. The forward-looking statements contained in this press release are made as of the date hereof and the Corporation does not undertake any obligation to update publicly or to revise any of the included forward-looking statements, except as required by applicable law. The forward-looking statements contained herein are expressly qualified by this cautionary statement. About this company Corridor Resources Inc.